PHILADELPHIA – Civil rights lawyer and candidate for District Attorney Larry Krasner headed to the finish of the last full week of his primary campaign by collecting several highly significant endorsements, including State Senator Vincent Hughes, Councilwoman Helen Gym, State Representative Chris Rabb, the Northeast Regional Council of Carpenters, and the Black Clergy of Philadelphia & Vicinity. On Wednesday afternoon, Krasner received resounding endorsements from City Council at-large member Helen Gym and State Representative Chris Rabb (D-200) at a rally focusing on the need to shift public resources from incarceration to education, in front of the School Department of Philadelphia (see video of Rabb and Gym). Also Wednesday afternoon, the Northeast Regional Council of Carpenters announced its endorsement of Krasner, saying, “The Carpenters Union believes in taking an active part in the political process. Our involvement in endorsing candidates lets our members know which candidates share our values and support our vision for the continued economic growth and expansion of our region." The Northeast Regional Council represents over 24,000 union carpenters, including 6000–7000 in its Philadelphia locals. 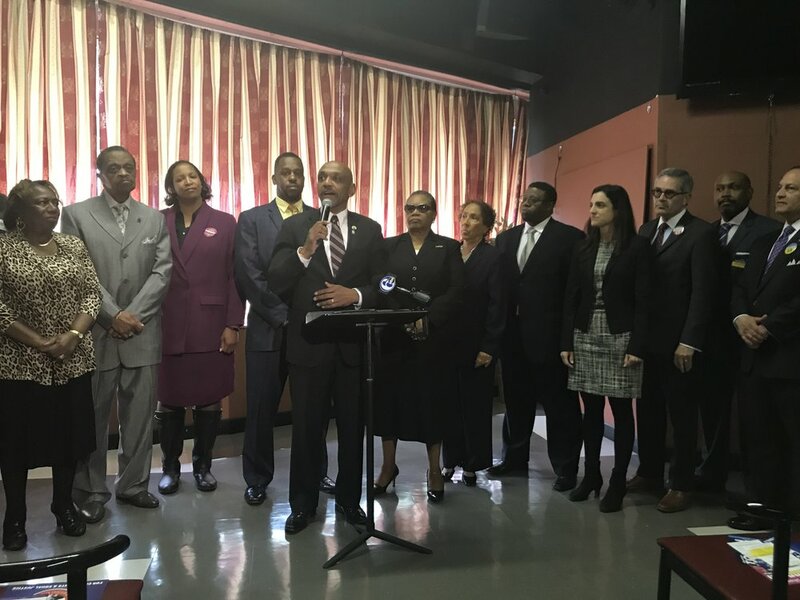 This morning the Black Clergy of Philadelphia announced its support for Krasner in a ceremony in West Philadelphia. The group is notable for its influence on voters who attend services the Sunday before elections. Newer PostPhilly DA's race: Krasner pulling away? Older PostWhere do the DA Candidates Stand on Transparency?